Ten stories, each one teaches a verse about conduct toward others. Paperback - $6.95, 90 pages. 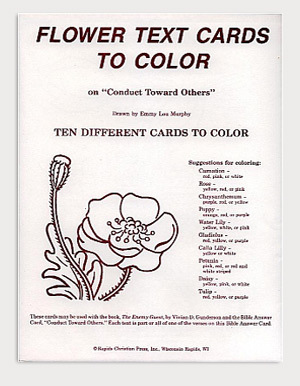 Optional 10-pack Flower Designs Coloring Cards. Each card contains a verse about the personal conduct that reinforces the messages in the book. Cards are printed on 8 x 11, heavy white card stock and packaged in a manilla envelope.